The future is horse. Horse is future. You sit on a bicycle with a virtual reality headset and you think, “Ok, maybe they’re going to put me in the Olympics or on a paper route.” You don’t think, “I’m about to turn into a four-legged animal and also sprout wings.” At least I didn’t. 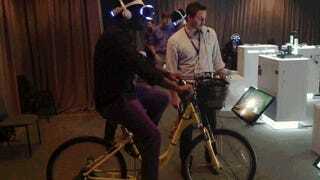 Yesterday, I took in a handful of the experiences that Sony is showcasing for Project Morpheus at E3. The weirdest one was a demo by VR company VirZoom that combines wheel sensors with the Sony VR. The user’s pedaling speed makes the horse gallop faster and turning the bike’s handlebars steers the horse. Thing get even weirder when I grabbed a wings pick-up that let me get airborne. I didn’t quite feel like I was flying but the disconnect of seeing an airborne viewpoint and pedaling with my feet was very trippy. The tech demo from Impulse Gear I played was much more in line with standard video-game fare. I played as a sci-fi soldier investigating energy anomalies on the planet below. The most bizarre thing with watching this video after the fact is realizing how much I was moving away from the screen. I played a few other Morpheus demos that used Dualshocks and Move controls, including a multiplayer game where I was a Godzilla monster that had to headbutt helicopters out of the sky. So far, my experiences with Morpheus haven’t made me physically disoriented. Mentally, though, some of them can be a real head trip.